The recommendations by the Commission of Inquiry should be “carefully considered and to the extent that the recommendations make practical sense, and will help to achieve greater accountability for the public purse, they should be supported and implemented expeditiously,” the Bermuda Public Services Union [BPSU] said. The Commission expanded on each recommendation, and you can read that in the full report [PDF/page 123]. The BPSU said, “The Commission of Inquiry has highlighted a number of concerns and recommendations where improvements could be made. 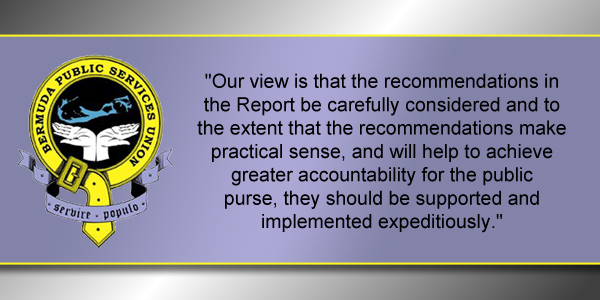 “Our view is that the recommendations in the Report be carefully considered and to the extent that the recommendations make practical sense, and will help to achieve greater accountability for the public purse, they should be supported and implemented expeditiously. The BPSU also said, “Civil Servants serve the Government of the day and they do so with great integrity, impartiality and objectivity. Civil Servants continue to work with the Premier and Ministers to ensure the best possible outcomes for Bermuda’s residents whom we serve. “Reducing the deficit by over $140 million. Ministries’ expenditure has been reduced by approximately $90 million and the number of employees have been reduced by over 600, 12% of the established posts. “It should also be noted that the COI Report and the Auditor General’s Report highlighted only a select few capital projects,” the BPSU said, adding that the “majority of capital projects and Government’s current account expenditure are being managed competently and effectively by civil servants including the four senior civil servants that were highlighted” in a media report. “The Commission of Inquiry Report recommends important changes in the way that civil servants do business. It also represents a change in the dynamics between Permanent Secretaries and their Ministers.